Wells Fargo announced a $60B mortgage lending goal to help bolster African-American homeownership rates by 2027. This commitment, which is in conjunction with the National Association of Real Estate Brokers, aims to create 250,000 new black homeowners by providing mortgage loans, financial education and counseling and increasing the diversity of the Wells Fargo Home Lending sales team. According to the U.S. Census Bureau, black Americans will represent 17 percent of new households by 2024. Unfortunately, black Americans — along with other communities of color — face a number of barriers to homeownership that include lack of access to affordable homes, depreciating home values in communities of color and higher home loan denial rates. 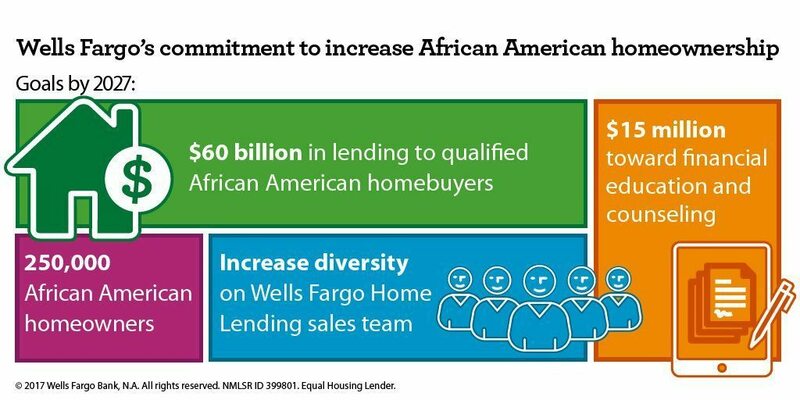 “Wells Fargo’s $60 billion lending goal can contribute to economic growth by making responsible homeownership possible for more African Americans in communities across the country,” said Brad Blackwell, executive vice president and head of housing policy and homeownership growth strategies for Wells Fargo, in a statement. “NAREB applauds Wells Fargo’s $60 billion loan commitment. The bank is the first financial institution to acknowledge publicly Black Americans’ wealth-building potential which could be greatly improved through homeownership,” said Cooper. In 2016, the association commissioned a study that revealed current credit-scoring models, lack of affordable housing, unemployment and under-employment and lack of access to mortgage credit among other things are the main barriers to homeownership for blacks. This is the second homeownership commitment Wells Fargo has made in the last two years — in 2015, the bank teamed up with the National Association of Hispanic Real Estate Professionals to support its Hispanic Wealth Project. Both commitments have come on the heels of Wells Fargo coming under fire for mismanaging repossessed properties in communities of color in 2012 and 2013. “Wells Fargo doesn’t have a perfect track record in the fair housing realm,” noted a report by Inman writer Teke Wiggin.